The other day, I found a kitty on the street near my flat and stopped to stroke it. 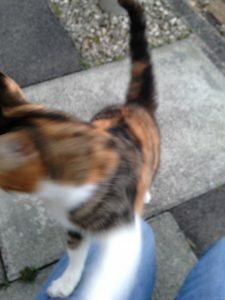 The kitty then followed me all the way home and was quite insistent that the stroking should continue. It was all set to follow me right into the flat and the only way I could stop it coming into the building with me was to distract it temporarily while I ran inside. I have seen the kitty on one other occasion, when my family were visiting, and it seemed equally keen to spend time with all of them. We decided to name her Kevinetta. My question is this. 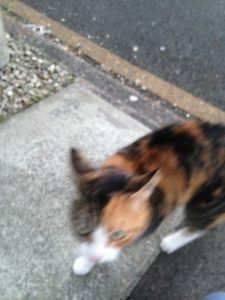 The kitty appeared to want to come and live with me, but I suspect someone else thinks the kitty lives with them. If I see the kitty again, can I keep it? It is your DUTY to care for said kitty. Kevin stole his cat. It’s only fair you steal yours, unless Steve is allergic and then it’s a nonny no no. Keep it! I’d work on the name, but keep the cat. Thank you all. My duty is clear. The next question is, if not Kevinetta then what? Perhaps Kevinia. That’s a nice name for a cat. Kevonardo’s clearly a boy’s name. Kevardinia is more appropriate. Did you steal the cat, by the way, or are you still deciding? I never saw the cat again. I feel so rejected. There there mate. Once you started roaming the streets with your kitty mobile you’ll find lots more to nick off with.